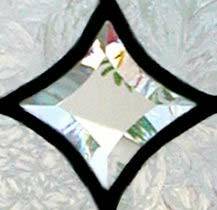 "STARS 6V" LEADED GLASS BEVELED STARS VERTICAL SIDELIGHT WINDOW CUSTOM AT GLASS BY DESIGN. Leaded glass sidelight window with beveled stars was 6" x 60". The size of this design can be altered by adjusting the vertical space of the sections and/or adding more sections or removing one or more. We highly recommend this for small spaces because it is stunning without being overly busy.